The afternoon we spent at Swallow Falls State Park, Maryland, in 2012 was such a hit with my kids that they begged to return in 2013. Swallow Falls State Park’s short, easy hike can be done in under one hour, or it can take your entire afternoon if you stop to splash in the river and relax under the towering hemlock trees. The two-mile hike passes four waterfalls and several calm, shallow areas where you can play in the Youghiogheny river. Over 30 inches of wet, heavy snow in October 2012 did significant damage to the forest and knocked down hundreds of huge trees. Thousands of hours were spent clearing trails to reopen the park, and the terrain has changed significantly since 2012, but the views are still spectacular. Many trees fell in a huge snowstorm in October 2012 but the trails are passable. 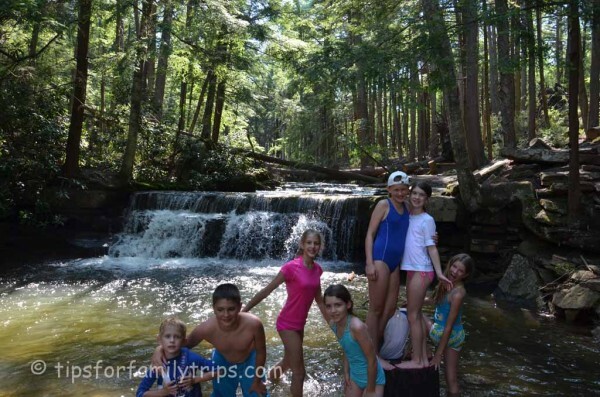 Here are my tips for a great family outing at Swallow Falls State Park. Trailhead with 3 moms and 13 kids. 1. Wear a swimming suit and hiking shoes. I prefer to hike in clothes, but this is one hike worth wearing a swimming suit so you can splash around with the kids in the water. There are many places to stop along the way and get in the river, and depending on the amount of rainfall that year, you may even be lucky enough to swim under one of the smaller waterfalls. I would never take children under Muddy Creek Falls, the first waterfall you come to, but I did see adults swimming at the bottom of the falls on my trip this summer. Drownings do happen at Swallow Falls, so be careful when and where you swim. Read Tip #4 and the comments for more information about swimming safely at Swallow Falls. 2. Bring water, a towel, and a camera. We all wore swimming suits and hiking shoes. I used one towel to dry everyone’s feet off after we played in the river so we could put socks and shoes back on. Don’t forget your camera to capture the spectacular views. I hiked this with two 2-year-olds the first time and they handled the hike just fine. The trail does have some rocky areas and stairs (it’s a hike, not a stroller trail) but the kids enjoyed it and even my littlest could hike it. The little ones had fun digging in the sand and dirt and throwing rocks in the river while the older kids swam. 4. Exercise caution about when and where to swim. Upper Swallow Falls in June 2012. The safest place to play in the river with children is Tolliver Falls, the last waterfall you come to. Be patient and wait until the end if the water is high at Upper Swallow Falls. In 2012, we could safely play in Upper Swallow Falls, but in June 2013 we wouldn’t even consider it. However, at Tolliver Falls, our kids played in the knee-deep pool and my 13-year-old and 11-year-old ventured out to their waists to crawl under the small waterfall. The water was COLD and kept them from doing anything too dangerous. Since I didn’t know what to expect, I clipped a life jacket to my backpack for my 6-year-old son and would have made him wear it if he had gotten in any water over his knees. 5. Expect crowds in the summer. This popular park is home to the tallest waterfall in Maryland and is a very popular place for locals and tourists as well. You will see many people there on a summer day, but there is plenty of room for everyone who wants to hike and play in the river. A calm and quiet place on the river to let small children play. At the trailhead, there is a covered pavilion with picnic tables. 7. Consider camping at Swallow Falls State Park. We didn’t camp here on this trip, but there are 65 campsites within the park and the setting would make for a lovely family camping trip. Nearby Herrington Manor State Park has a swimming beach, boat rental, and a snack bar in the summer. Location: Oakland, Maryland. A 15-20 minute drive away from Deep Creek Lake. Cost: $3 for Maryland residents, $5 for out-of-state visitors. Anyone in a car seat or booster seat is free. When to go: Summer is the most popular time to visit, but the park is open year-round and hiking or snowshoeing through the snowy trees in the winter is supposed to be serene. Amenities: Restrooms, small gift shop, picnic tables, playground, covered pavilion, camping. See a map of the park here. I use to be a State Park Ranger there and there were many injuries due to the slippery rocks, or sharp objects in the water. We never would recommend anyone swim there, except Tolliver Falls of course! On top of that when the river is high it is very dangerous near the falls and we had one drowning in the river which was devastating. I would always suggest people go to nearby Herrington Manor State Park to the lake which is lovely and safer. Also make note in the summer Swallow Falls fills up early most weekends and if you want a campsite on a weekend you should book well in advance. I’m so sorry to hear about this, Lisa. Thank you for the reminder that nature is both beautiful and dangerous. Please please please do not encourage people to swim at the falls. It is extremely dangerous. We just had a drowning here on August 13, 2017 and there was one on July 20, 2016 as well. Families especially with children should be warned to stay on the trail and NOT venture into the water.